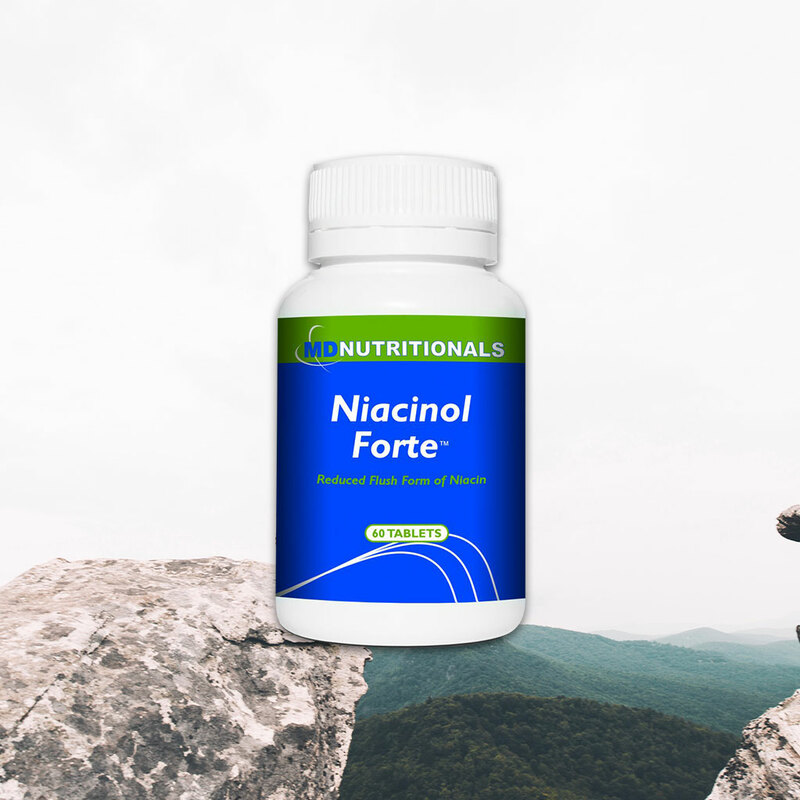 Niacinol Forte™ features inositol hexanicotinate, an extended release niacin that consists of six molecules of nicotinic acid bound to one inositol molecule. Inositol hexanicotinate is a bioavailable source of niacin (vitamin B3). This extended release niacin is formulated to increase tolerability. Inositol hexanicotinate does not cause significant vasodilation, or ‘flushing’, normally associated with immediate release nicotinic acid. Oral administration of inositol hexanicotinate results in a steady increase in the level of nicotinic acid in the body. This form is metabolised slowly, not reaching maximum blood levels of nicotinic acid until approximately 6-10 hours after ingestion, whereas standard nicotinic acid is quickly absorbed within 30-60 minutes. 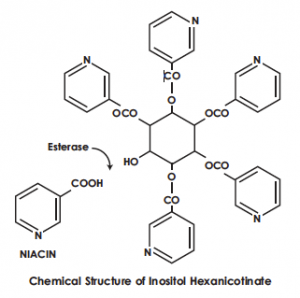 Inositol hexanicotinate supports niacin levels in the body. Niacin is an important B vitamin that is involved in a wide range of biological functions including cholesterol synthesis. Cholesterol is a waxy, fat-like substance that’s found in all cells of the body. Cholesterol attracts clinical attention when present in abnormal concentrations. Raised total cholesterol is a factor that increases cardiovascular disease risk. Other factors include older age, gender (men are at higher risk), elevated low-density lipoprotein (LDL) cholesterol levels, reduced high-density lipoprotein (HDL) cholesterol levels, elevated homocysteine, hypertension, type 2 diabetes, smoking, obesity, physical inactivity, and genetic changes which contribute to susceptibility. Niacin may help maintain healthy cholesterol levels to support cardiovascular system health. Studies show niacin reduces total cholesterol, low density lipoprotein (LDL) cholesterol, triglycerides, and lipoprotein (a) levels, and also markedly raises high density lipoprotein (HDL) cholesterol. Inositol hexanicotinate is a source of niacin which may support blood flow to the peripheral areas of the body including legs, hands and feet.